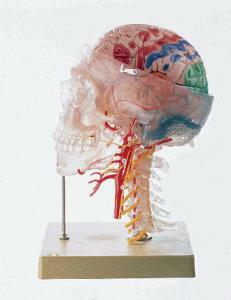 This unique model allows students to see through the skull to the underlying structures to help them understand how the components of the human head are contained and organized. The cranium can be removed, as can the eight-piece brain, to show functional areas, including cervical vertebrae with cranial and spinal nerves, and arteries. The ten-piece model is mounted on a stand .